This is version 0.6 of the plug-in. 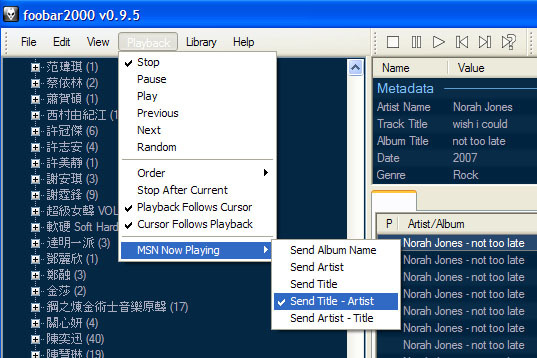 Fixed the bug that MSN displayed garbage when foorbar was closed during music playing. 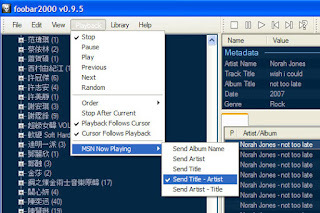 This plug-in is for the foobar2000 music player. 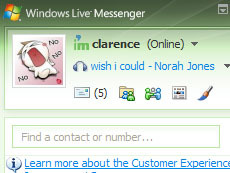 It sends the song information to MSN Messenger for display. The component is available here. Save the file under the components directory of foobar2000 (e.g. C:\Program Files\foobar2000\components) and restart the program. There will be a new item added under the Playback menu. Select the format of info that you want to show on MSN. Also remember to turn on the "Show what I'm listening to" feature on your MSN Messenger. The C++ source code is also available. You will need to download the foobar2000 SDK in order to build it. Er, I mean...I really appreciate you putting this up. Very helpful and easy to use. Could you update this to support internet radio stations? At the moment, it's only showing the name of my radio station not the song shown in foobar2000. But could you add play/remaining time also?